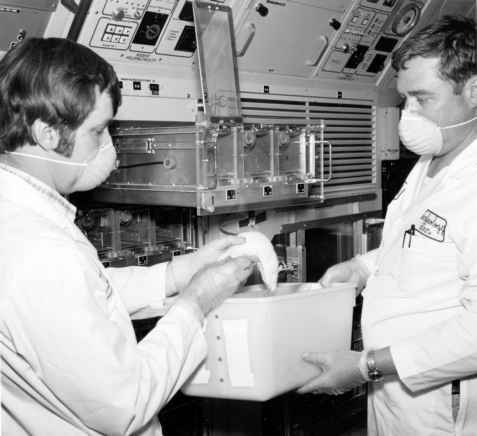 The three SMD simulations were preparations for future medical Spacelab missions to be flown on the Shuttle. They were based upon the strong precedent set by SMEAT and Skylab, in that any mission of this complexity required a ground-based simulation to iron out any developmental problems and to enable operations on orbit to run more smoothly. The crew for SMD-III. 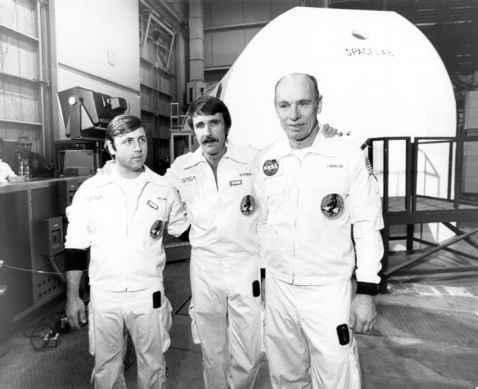 Left to right: Carter Alexander, Bill Thornton and Bill Williams inside the simulator during preparations for the test. The rats are prepared for the SMD-III test. The development of the series, and especially the third simulation, caused some friction between the NASA field centres involved, principally JSC and Ames. The Ames Research Center initiated the programme because it was developing animal research facilities for Spacelab life science missions. 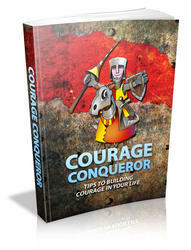 They acted as managers of the SMD program. Ames intended to have its own mission control, with its own scientist controlling the simulation (which they did to a degree for SMD-III). This caused many heated management meetings and discussions between JSC and Ames. There was also the issue of the varied depth of experience of the principal investigators of the range of experiments that would be included, as well as hardware issues - in particular with the animal holding facility that eventually flew on Spacelab 3 in 1985. Crew selection for SMD-III resulted in some of the strongest political in-fighting, because each of the scientific factions had their own candidates for inclusion in the final simulation. It almost reached the point of a team of payload specialists completing the simulation, rather than including NASA astronauts in the crew. The intent was to simulate the procedures and hardware of all the experiments, many of which had undergone shakedown tests on the first two simulations. SMD-III provided an opportunity to try all the experiments, hardware and procedures in one go, but many were nowhere near ready to proceed to flight assignment. This was also one of the stages in the history of the CB where the influence of the NASA astronauts was being diluted by politicians and bureaucracy. The Astronaut Office philosophy at that time (mid-1970s) was that "any job would be executed as perfectly as it could be by the people on the flight and those in flight were primarily responsible for production of the results." Therefore, the most logical course was for the simulations to be prepared as though they were an actual space mission (with checklists, timelines and a formal way of approaching the task and objectives). The philosophy of astronaut training at that time was for repetitive development of procedures, using hardware that was as identical as possible to the actual flight hardware, allowing the flight crew to become so familiar with the experiment or objective that when it was performed in space, it had become second nature to them. On any space flight there are enough unexpected events that occur without having to overcome unfamiliar procedures or situations. The science community involved in developing experiments for life sciences missions on Spacelab at that time were totally unfamiliar with the operational constraints. There was a serious lack of understanding not only of space flight operations but also of conditions relevant to weightlessness - to such an extent that one proposal included the use of ethyl in an open dish on board the SMD-III simulation, something totally unacceptable for an experiment on orbit. Another absurd proposal was for the astronauts to monitor the mating habits of fruit flies in weightlessness and then describe them, rather than setting up an automatic camera to film the event. Clearly, no astronaut would be prepared (or would have enough time) to watch fruit flies copulating in space - or anywhere else - for hours. 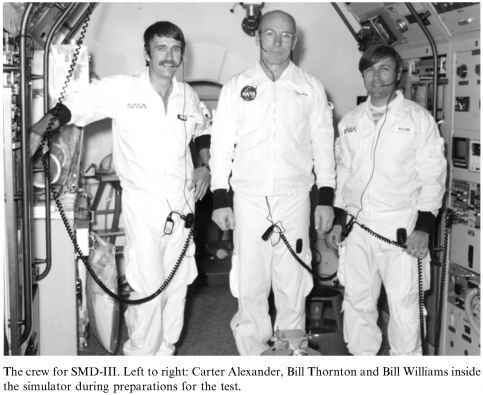 Once he was assigned to SMD-III, Bill Thornton participated in numerous meetings in which he tried to establish procedures for operating each of the experiments on the simulation. This included potential failure modes and how crewmen might be able to recover from them successfully. There was a huge lobby at the time to perform experiments on animals in space, just as there had been with animals on Earth. The argument was that it was too dangerous to attempt such experiments on humans in space first. However, most of the experiments proposed were out of date and enough of the information had already been discovered to make many of the research fields irrelevant to human adaptation to space flight. The proposals went ahead, but there would be other considerations, such as the handling and care of the animals (including feeding and waste management). There were also numerous problems in developing the cages; too many to deal with in the simulations, but problems which would come back to haunt the crews who worked with these cages on Shuttle flights. There was also a problem with some of the test rats attacking each other, which made it difficult to collect viable data. 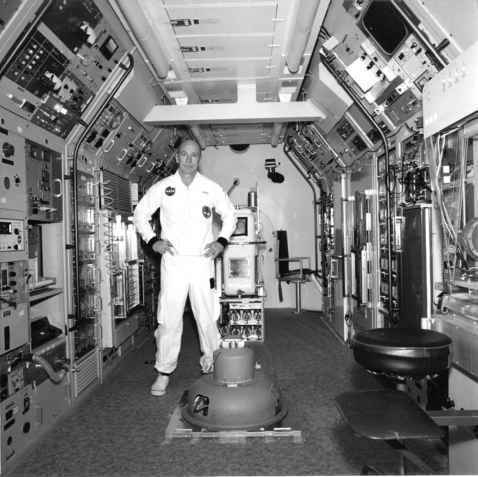 Bill Thornton inside the Spacelab mock-up for the third SMD test. The development of hardware to simulate what would fly on a real Spacelab mission is evident in a comparison of this photo to that of the 1974 simulation. the crew and the pressure being put upon them by scientists to work with inadequate experiments and equipment. On SMEAT the astronauts could at least become involved in the development of hardware at JSC, and could inspect and repair the equipment where necessary. But since SMD was not driven by JSC, it was more difficult to instigate changes or amendments to the tests. 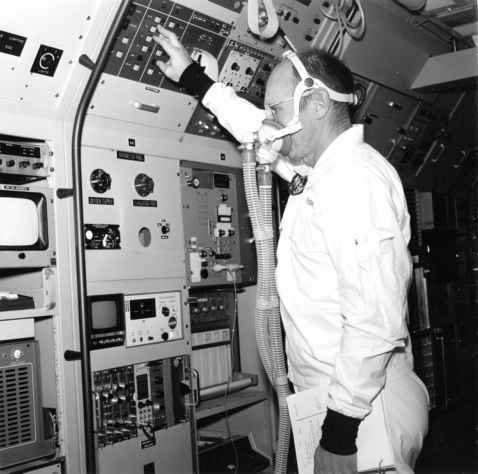 Bill Thornton at one of the work stations during the SMD-III test. on SMD-III, he could not do this. Hardware for SMEAT had been designed by people already involved in space flight - and more specifically, Skylab - hardware development at Marshall Space Flight Center. They had never constructed medical equipment before, but understood the problems and were willing to listen and amend the experiments to "get it fixed." The CB was very much in control of the test operation - not in management decisions as such, but certainly in having a voice that would be heard. The "voice" that was listened to for SMD-III was that of the scientists, rather than the Astronaut Office, and the equipment came from a group unfamiliar with developing space hardware or operations. On nominal space flights, volumes of material are written or filmed (or passed on from personal experience) and available if troubleshooting is required to resolve a problem. The idea was not to wait for the crew to get into difficulty and have to solve the problem through communications with the ground. It was the crew that were the front line for resolving problems. On SMD-III, however, there were no troubleshooting efforts, nor wiring diagrams for the experiments. When the Astronaut Office assigned Thornton to the "crew", the hardware was still being built, as were the experiments, and there were myriad examples of totally inappropriate procedures that hindered the training programme's development. 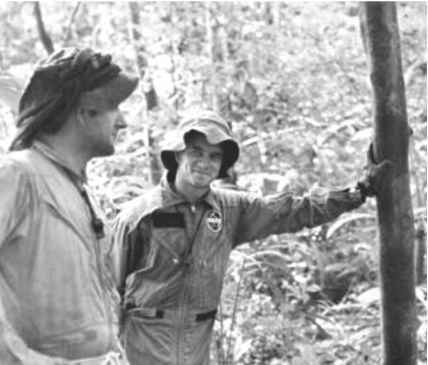 Eventually, after much wrangling, Thornton developed troubleshooting procedures and a suitable timeline for an operational "day" during the simulations. Still, there were delays in setting up the operation centre at Ames, and the difficulties encountered in placing an operational mission control at JSC and a scientific mission control at Ames showed that such a set up would not work, so the scientific mission control for SMD-III was located at JSC. Thornton's perception was to do what the astronauts always aimed to do - to complete any job to the best of their ability, with sufficient training and adequate tools to ensure their tasks were accomplished. If something was seen to be going wrong, controlled communications would assist in troubleshooting and resolving the problem, or terminating the task if necessary. Proper calls would be adhered to and no inappropriate "chatting on line'' would be allowed. But this methodology ran contrary to the scientists' concepts of what should be done on the simulation. SMD-III, for them, was an extension of their own labs, in which they would make real-time decisions and tell the "lab crew'' what to do. As trained scientists, the crew would do what the ground scientists wanted but how they actually accomplished this was down to them. For Thornton, this meant by-the-book in space flight fashion, using procedures and checklists. Unless the crew needed to talk to the ground scientists, he felt they should stay off the line until requested to discuss something by the "flight crew''. This system worked well on past missions, with everything going through the astronaut Capcom apart from any direct intervention by the Flight Director. The conflict between the two views caused friction until Thornton was advised to relax a bit on the communications. His frustration, and fear, was over uncontrolled communications between several scientists and "crew members'' without a central control filter (a Capcom) blocking communications, thus wasting crew time on irrelevant discussions and probably bypassing checklist procedures. Thornton's argument was that NASA should have flown scientists who worked as part of an investigating team as "servants" of that team. There were so many problems that there was no room for time off. The crew stayed on top of the situation but it was "messy" and frustrating to the astronaut. Additionally, little actual Shuttle equipment could be tried out as it was too early in the programme, so Skylab equipment was used. They did try to use a prototype of the Waste Collection Systems, however, and in a perfect prelude to the problems encountered later on Shuttle missions, it failed completely and was replaced by a Port-A-Loo device. The simulation was certainly far advanced from where they started, but there was a lot to learn from the situation. It illustrated that, apart from very few exceptions, the future payload specialist/scientist on orbit would not so much be a scientist as a servant of the investigators. The crew celebrates the end of a successful but challenging simulation, thus ending the series of simulations begun in 1974.
the problems, but by golly, I shudder to think what might have been if we had not done it. There were some first rate trainers, but the procedures in getting some of the experiments defined for the simulation were hard enough, without trying to evaluate them for space flight conditions." It was a hard learning curve for all, and one that was not totally learned by the time Spacelab 3 flew almost a decade later in 1985! SMD-III was the final Spacelab-based simulation prior to specific mission training and preparations for orbital operations.